Zuid Zeeland is a quaint little restaurant on the Herengracht. The service is excellent and the location is ideal. 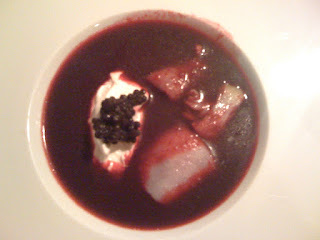 While I can't say too much about the decor, the food was excellent, especially the beet soup. A perfect mix of salty and creamy, this soup combines a healthy dollop of crème fraîche, a heaping pile of herring caviar, smoked halibut and a flood of lukewarm red beet broth. On a nice evening, sip the beet soup at one of the few outdoor tables overlooking the canal.